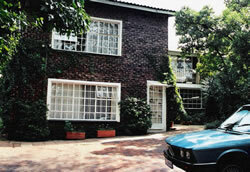 Randburg is central for all aminities, we offer a comfortable B+B and self-catering, 4 star grading. large sunny rooms,on-suite,and own entrance ,lovely gardens and swimming pool.secure parking . close to Cresta Mall, Brightwater Commons, The Dome ,easy access to N1 highway. airport transfers can be aranged on reqest. we offer the best come and enjoy that personnal touch. Relax or go shopping, visit the Lion park and touch baby cubs. visit the Cradle of Humanmankind, or the Craft Market at Rosebank on Sundays , eat at Brightwater Commons and Bowl at the ally in Cresta Mall.visit GoldReef city and Ice scate at Northgate. and lots More. Large Sunny lots of space. King Bed .Single bed Sleeper Couch and Baby cot.desk TV. full bath room ,own ent.very comfortable.seperate kitchen.fully equiped. enjoy. Comfortable large sunny ,king bed and single bed ,desk TV and own Ent.shower on suite, and seperate kitchen.fully equiped . Wonderful secluded room, Queen bed with sliding doors opening onto the garden and pool, desk, TV, on suite and seperate Kitchen . relax.